“An international team of researchers has developed a new light-based manipulation method that could one day be used to mass produce electronic components for smartphones, computers and other devices. A cheaper and faster way to produce these components could make it less expensive to connect everyday objects — from clothing to household appliances — to the internet, advancing the concept known as the Internet of Things. The micromanipulation technique might also be used to create a safer and faster-charging replacement for mobile device batteries. In The Optical Society (OSA) journal Optics Express, researchers in Steven Neale’s Micromanipulation Research Group, University of Glasgow, Scotland, detail their method for using an advanced optical trapping approach known as optoelectronic tweezers to assemble electrical contacts. Thanks to an innovative freeze-drying method developed by Shuailong Zhang, a member of Neale’s research group, the liquid could be removed without disturbing the assembled components. The new technique could offer an alternative way to make the circuit boards that connect the components found in most of today’s electronics. These types of devices are currently made using automated machines that pick up tiny parts, place them onto the circuit board and solder them into place. This process requires an expensive motorized stage to position the board and a costly high-precision robotic arm to pick up and place the tiny parts onto the device. The cost of these micromanipulation systems continues to rise as the shrinking size of electronics increases precision requirements. The researchers used optoelectronic tweezers because this optical manipulation approach can form thousands of traps at once, offering the potential of massively parallel assembly. The tweezers are formed using a layer of silicon that changes its electrical conductivity when exposed to light. In the areas exposed to points of light, a non-uniform electric field forms that interacts with particles or beads in a liquid layer on top of the silicon, allowing the particles to be precisely moved by moving the point of light. Creating patterns of light points allows multiple particles to be moved simultaneously. After using the optoelectronic tweezers to assemble a pattern of 40-micron-diameter, commercially available solder beads, the researchers froze the liquid in the optoelectronic tweezer device and then reduced the surrounding pressure to allow the frozen liquid to turn from a solid directly into a gas. 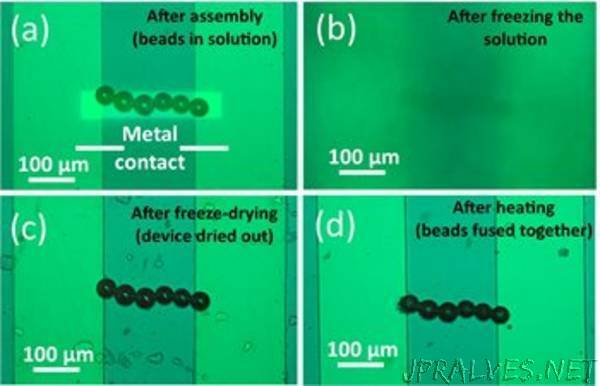 This freeze-drying approach allowed the assembled solder beads to remain fixed in place after the liquid was removed. The researchers say it can be used to remove liquid used with any type of optical trap, or even traps formed with acoustic waves. In addition to assembling the solder beads into different lines, the researchers also demonstrated parallel assembly of several beads and used the beads to form electrical connections. The solder beads exhibit a strong dielectric force, which means they can be moved accurately and fast, allowing very efficient assembly of structures.